Both NEBOSH and IOSH qualifications provide great foundations for careers in health and safety. Whether you are looking to begin a career in occupational health or are looking to advance in your current position, these courses can help to boost your CV and set you apart from the competition. In reality, a NEBOSH National General Certificate is an essential qualification for any full-time health and safety job. It provides you with a great knowledge base and the foundations required to build your career. Covering areas such as identifying hazards and completing risk assessments to name but a few, people that have completed this course have gone on to begin wonderful careers in health and safety. Health and safety advisors are employed in a whole host of industries, you could find yourself working with hazardous chemicals at an engineering firm or even in food production. Hazards are everywhere and so companies need to employ individuals, or at least provide training to individuals who can prevent them. With the right knowledge of keeping your workplace and co-workers safe the possibilities are endless. Daily tasks for a health and safety professional include developing safety procedures, training staff and making regular inspections. 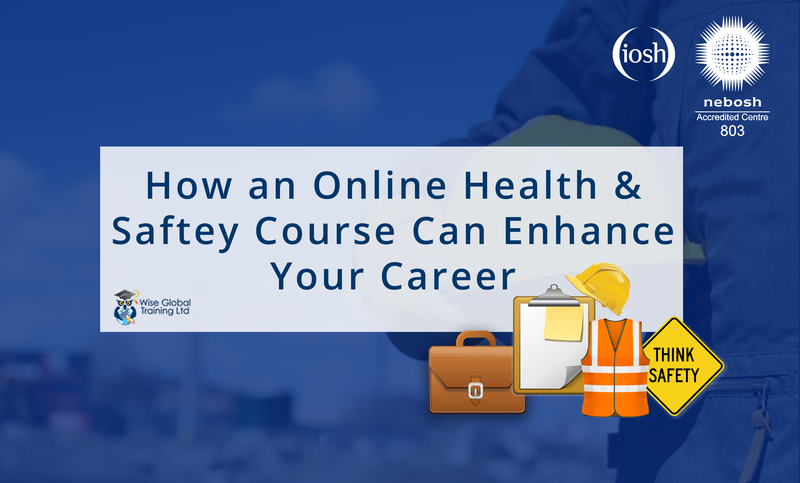 Completing an IOSH or NEBOSH online course will give you the confidence to carry out these abilities as well as completing risk assessments and identifying workplace hazards. All of these aspects will help you to keep your workplace safe regardless of the industry. Ensuring the safety of your co-workers is the most important job within any company, as their health essentially rests on your shoulders. This why NEBOSH and IOSH courses are favoured by those who are recruiting for such a position, as they are aware that it gives you the knowledge and experience required to handle the obligation. However, you can be sure that the responsibility will pay off. A health and safety advisor’s starting salary usually averages at around £22,000 which can raise to £70,000 when you reach the top of the ladder. As internationally recognised qualifications many businesses register their staff to online courses for additional training, this means that anyone with this on their CV before entering a job is held in the highest regard. Whether you are hoping to gain a basic understanding of health and safety or are looking to get into management with the help of the IOSH Managing safely course, these qualifications can help you to stand out. We provide online safety courses for people of all abilities and skill levels, from entry level to management. To find out more about what our range of NEBOSH and IOSH online courses can offer you, give us a call on 01482 211989 and our team will be happy to help.